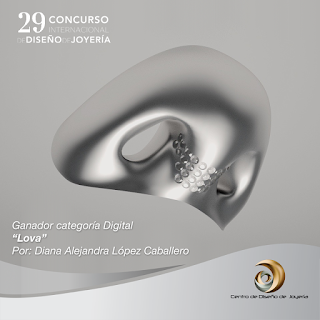 Diana A. López Caballero is a product designer with experience in jewelry design, art, and mostly 3D modeling and computer design. She is certified in many courses in jewelry design and completed McNeel Miami's Minor in Digital Fabrication where she learned advanced 3D digital modeling with Rhino, generative and data driven modeling with Grasshopper as well as hands on manual fabrication. We would like to congratulate Diana as she recently won the 29 International Contest of Jewelry Design by Centro de Diseño de Joyería in México. This contest aims to encourage jewelry design based on fashion trends, and to discover and promote new talents. Diana demonstrated her skills, knowledge, and creativity in her designs. For information please contact Diana A. López Caballero.